Good day from Baton Rouge. It feels a bit like déjà vu today with the Owls playing in the same city in the opening round of the 2017 NCAA baseball tournament as 2016. Even three of the four teams — Rice, Louisiana State University (LSU) and Southeastern Louisiana University (SLU) — are the same as last year. AND, weather could also be a factor this weekend. The guys woke up this morning to a breakfast buffet at the team’s hotel before starting game-day preparations. 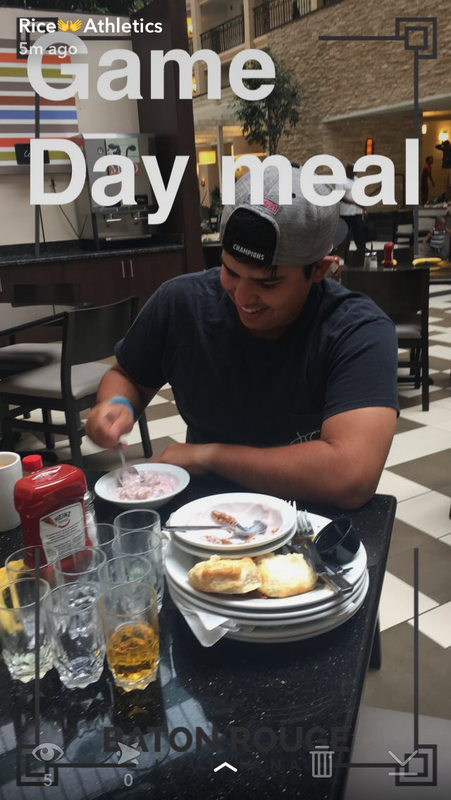 We spied team senior student manager Michael Kidd taking real advantage of the buffet. Okay, into our own game-day prep. Knock on wood: The weather looks like it will cooperate for today’s games. The chance of rain from 2 to 10 p.m. runs from 15 to 30 percent. The rain could become more of an issue Saturday and Sunday. 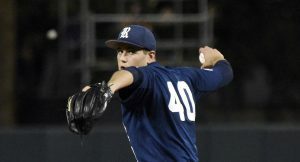 Typically in the regional round of the NCAA baseball tournament, a team would face an unfamiliar foe. However, Rice knows SLU well now. Rice faced SLU in two games last year in the regional, winning them both, but this year SLU took two out of three games from Rice at Reckling Park. “(SLU is) 36-20. Finished the regular season winning 12 of their last 15. SLU has six victories against top 50 RPI teams. (They) might have lost some momentum with their play in the Southland Tournament, where they went 1-2. “The Lions have three players with 10 or more home runs, Taylor Schwaner, Carson Crites and Ryan Byers. This team is also speedy on the base paths with 110 steals. Rice has played 134 total games in the NCAA Tournament since 1995, including regionals, super regionals and the College World Series. 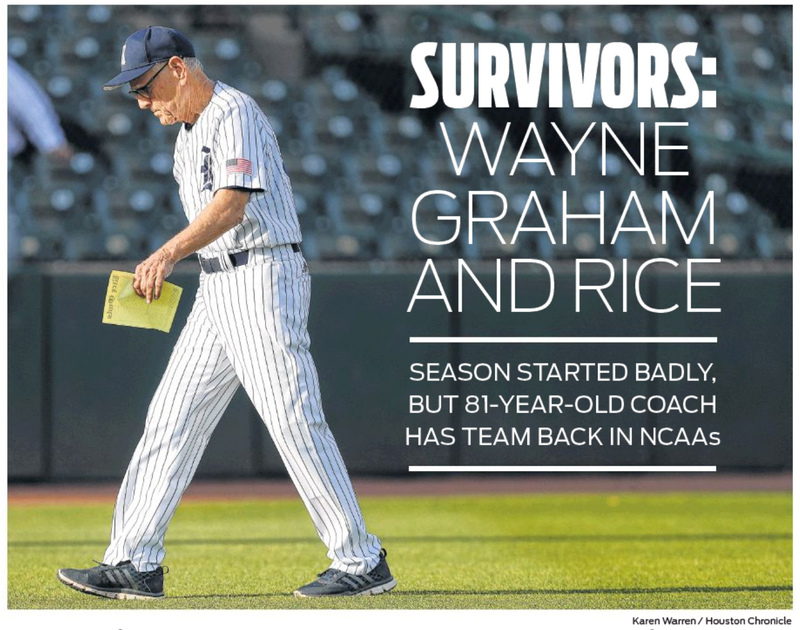 All of the program’s NCAA Tournament games have been under the direction of head coach Wayne Graham. His (and the program’s) record in the “The Dance” is 83-51 (.619). 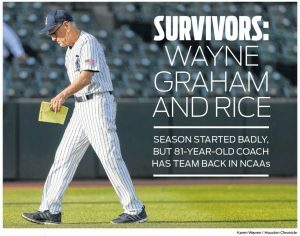 If you want to find out about almost one-seventh of the entire NCAA Tournament field, just ask Rice. This year the Owls have already played 23 games against nine different teams in The Dance. The Blue & Gray won a total of 10 games against programs in the current 64-team NCAA Tournament field. In fact, each of the Owls’ first nine games to start the year (versus the likes of Texas, Dallas Baptist, Southeastern Louisiana and Texas Christian University) all went on to make the NCAA Tournament. Veteran Charlie Warren has a nine-game hitting streak where he is 16 for his last 35 (.457), but he also has two home runs and a double for a .657 slugging percentage. Warren has driven in 10 runs, scored eight times and stolen two bases in the last nine games. Junior third baseman Dane Myers also extended his hitting streak to nine games and is now 16 for his last 41 (.390) with two home runs and three doubles for a .610 slugging percentage. He has 11 RBI, 11 runs scored, three steals and a .444 on-base percentage in the last nine games. Keep an eye on Dayne Wunderlich, who is 9 for his last 23 (.391) with three doubles, five runs scored, two sacrifice bunts and a stolen base over the last seven games. In the C-USA Tournament he also had a dramatic leaping catch above the fence to rob a home run away versus Florida Atlantic University. Junior second baseman Tristan Gray is 7 for his last 19 (.368) with two homers and a double for a .737 slugging percentage. He has five RBIs, four runs scored and a .429 on-base percentage over the last five games. 7 p.m. or 55 minutes after the completion of the prior game at the Baton Rouge Regional. Watch the game on the Watch ESPN app or online at espn3.com. Live stats will be available at http://www.ncaa.com/game/baseball/d1/2017/06/02/rice-southeastern-la. And the Rice radio broadcast will be available at https://portal.stretchinternet.com/rice/. This post may be updated with more information just prior to game time.